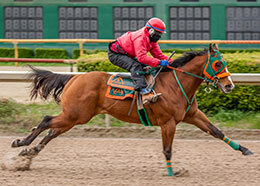 Mercy Hinklins Horse Farm's Seis Train B, under jockey Everado Rodriguez, posted the fasted time from eight 2-year-old schooling races Friday at Louisiana Downs. BOSSIER CITY, LA—FEBRUARY 8, 209—A pair of two-year-old homebreds racing for owner/breeder Mercy Hinklins Horse Farm LLC book-ended eight schooling races for Harrah's Entertainment Futurity(G3) hopefuls on Friday by posting wins in the opening and closing races and recording the top two times from 41 juveniles who participate. 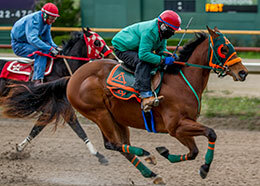 Both 2-year-olds were saddled by trainer Lanny Keith and ridden by jockey Everado Rodriguez. Seis Train B, a bay colt by multiple grade 1 sire Freighttrain B closed out the 220 yard eight-race card with a three-quarter length win off the inside rail while recording the fastest time of :12.186 seconds. Out of the restricted grade 1 finalist Legendary Seis, by leading broodmare sire Tres Seis, Seis Train B is a half-brother to stakes horses A Noble Jess Elie and Valid Expectations. This is the family of restricted grade 3 winner Cash Alliance. Hinklin homebred Tressels Going Grand kicked off the day by posting a one-length win in the second fastest time of :12.242 seconds, from the 5 post in Race 1. The bay gelding's sire FDD Going Grand, also owned by Hinklin, ended last season as the #5 Leading second-crop sire of money earners with only 11 starters. 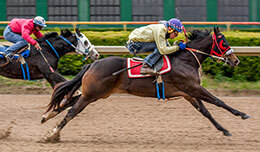 Tressels Going Grand, under jockey Everado Rodriquez, posted the second fastest clocking in Race 1 on Friday. Tressels Going Grand's dam,Tres Seis Diamonds, also by Tres Seis, is a sister to Grade 1 winner Diamond Tres Seis and a number of other black type runners. All American Derby(G1) winner Medley Glass is the third dam. Trump My Record posted the first of two wins for trainer Arturo Davila III, with a three-quarter length victory in Race 3, clocking the third fastest time of :12.246 seconds. Cruz E. Nava purchased the colt by first-crop sire Apollitical Blood in the 2018 TQHA Yearling Sale for $10,700. The bay colt is out of the Pyc Paint Your Wagon mare Break N Records, a half-sister to All American Futurity(G1) third-place finisher Aha Moment and grade 3 placed Man Who Would Be King. Fulton Quine Sabe Ranches, LP's grade 2 winner Thrill And Grace, by Mr Jess Perry, is the second dam. Eddie Sanchez had the riding call. Trump My Record and jockey Eddie Sanchez clock 220 yards in :12.246 seconds in Race 3. In Race 7 Davila III saddled Baby Licious, a daughter of world champion sire FDD Dynasty, to a one-length win in :12.299 seconds, the day's fourth fastest, for owner Santos Muzquiz de Los. Also ridden by Sanchez, the bay filly is the first foal from the Feature Mr Jess mare Da Licious. The second dam is is Grade 2 Lubbock Stakes winner Da Edge, by Separatist, and third dam is the two-time AQHA Racing Champion Deelish by First Down Dash. For a complete list of horses, with times and placings, that participated in today's schooling races CLICK HERE. Freighttrain B led all sires with two winners on the card. Other sires with winners included Capo de Cap, Down N Dash and Simply Macho. 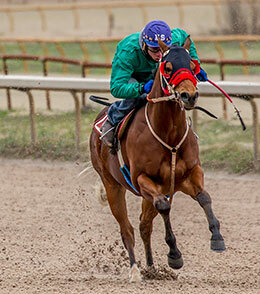 Trails for the Grade 3 Harrah's Entertainment Futurity will be conducted Saturday March 2nd the final will runback on Louisiana Downs closing Quarter Horse meet day March 20.